Spring Semester’s Forum on Italian Studies, with both Italian scholars and graduate students in this field of research. For further information please contact: Mona Delgado, Mona_Delgado@brown.edu. The Italian Studies Colloquium is a bi-weekly forum for an exchange of ideas and work of the community of Italian scholars at Brown and invited outside scholars. Graduate students present their work in progress, and engage the work of faculty and visitors. Presentations in both Italian and English. All colloquium sessions (six per semester) are held in room 102 of 190 Hope Street at 12 noon- 1:30pm unless otherwise noted. For further information please contact: Mona Delgado, Dept. Manager, Italian Studies – Brown University (401) 863-1561 or Mona_Delgado@brown.edu. 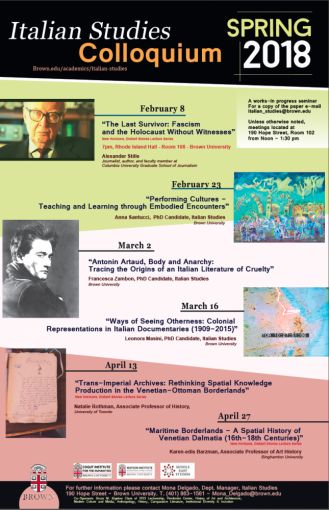 Colloquium Spring 2018Feb. 9, noon-1:30pm: Informal Lunch for Italian Studies faculty and grad students with Alexander Stille, journalist, author, and faculty member at Columbia School of Journalism. Sessione primaverile del Forum sugli Italian Studies, con la partecipazione di accademici e studenti che lavorano in questo campo di ricerca. Per ogni informazione: Mona Delgado, Mona_Delgado@brown.edu.